The flavor of this mushroom tetrazzini makes me feel all warm and cozy inside. It is the most comforting dish I can possibly imagine, perfect for all the cold days. I want to eat this mushroom tetrazzini every day for the rest of winter. Good thing it is a one pot meal and ready in under 30 minutes! Making it super easy to fulfill my dreams! It comes out of the oven steaming hot, with brown and crusty bread crumbs on top! The edges of the dish that are crisp are my absolute favorite! Warm, creamy, dreamy, hearty, healthy. The flavor is kind of indescribable, but once you take a bit, you will understand. Then be confused about why something so easy and simple can taste so amazing. 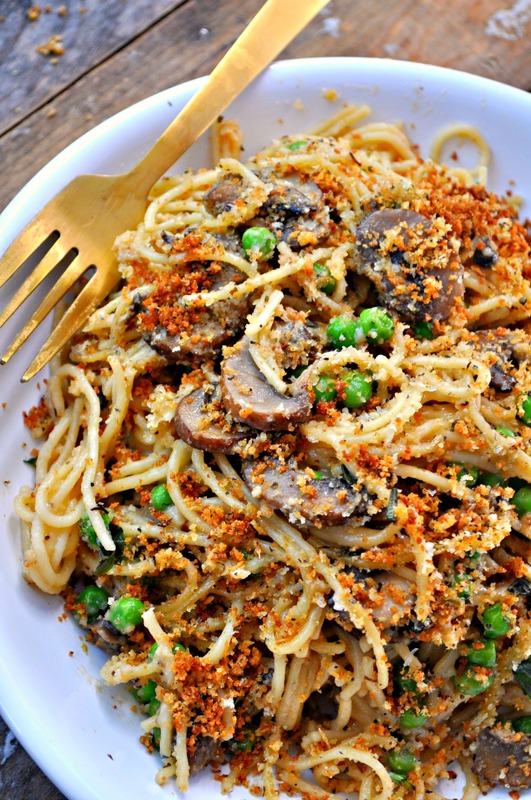 My vegan take on the classic Tetrazzini dish. Creamy noodles, mushrooms and peas. One pot then baked with bread crumbs on top! Now in an oven safe pot, heat the olive oil on medium high. Then add the sliced mushrooms and garlic. Saute for 4-5 minutes until the mushrooms have released their liquid and it has evaporated. Season with salt and pepper. Once the mushrooms are done, remove them from the pot and set aside. Now add the vegan butter to the pot and melt. Reduce heat to low. Cook for a minute, stirring, then add the flour. Whisk together to make a roux. Cook for another minute or two until it has thickened. Now add the veggie broth and almond milk. Whisk to combine with the roux. Now bring heat up a bit, and bring to a boil. Season with a bit of salt and pepper. Then add the spaghetti. I like to snap mine in half. Then stir to make sure it is fully covered by the liquid. Cook for just about 3-5 minutes(you want it still to be a bit firm when you put it in the oven so it doesn't over cook). Stirring. Then add back in the mushrooms and the frozen peas into the pot. Stir to combine. Cook for just another minute. Taste and adjust seasoning. Now turn off the heat. In a bowl combine the panko and nutritional yeast. Sprinkle on top of the pasta. Now either drizzle with olive oil, spray with non stick spray, or put a few pieces of vegan butter on the top just to brown the bread crumbs. Bake at 450 degrees for about 10 minutes until bubbly and the top has browned. Serve immediately with parsley if you want!